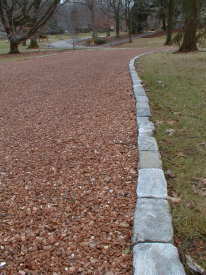 Would you like a driveway that has gravel chips that have multi-colored sparkling minerals in each stone? This 42-page Contractor Hiring Guide will allow you to get the best and most beautiful driveway in the neighborhood. It provides you with all the questions you need to ask the contractor before signing up. Can you imagine a deep-brown colored gravel driveway? How about one that is light green, red or even buff colored. All of this and more is possible. Would you like to see what a Checklist looks like? Click Here for a FREE one. The Contractor Hiring Guide & Checklist is available to you as an immediate download once your order is processed. After completion, you will be taken to a page with a download link for the Contractor Hiring Guide file. In addition, you will receive a confirming email. In the Cart Items section of the email, there will be a download link. Just click on the link and the Checklist will be downloaded to your computer. The downloaded file can be read using the free Adobe Reader software. Click the button below to add the Asphalt/Blacktop/Tar & Chip Installation & Repair Contractor Hiring Guide & Checklist to your wish list.